From left: Cole & Son; Tyler Hall; Pierre Frey; Cole & Son. 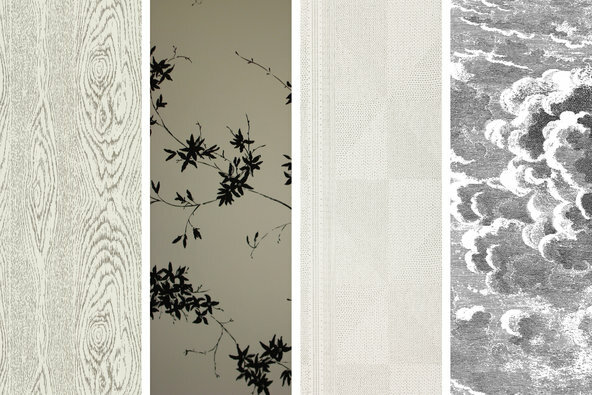 Since remodeling my new London apartment, I have been on the look out for new wallpapers. I did a major trawl and returned to my office with quite a few black-and-white options. My favorite is the floral First Bloom print in Night Blossom by Tyler Hall that I love and have just wallpapered my new bedroom in. It looks like Cecil Beaton might have drawn it, and it makes me think of those 1950s dresses with sprays of flowers across them. Black and white are of course terribly easy to mix with almost anything, and I have accented this print with a lot of blue: double-lined curtains made of black and blue felt, and Roman blinds made of Nicky Haslam’s Shutter Stripe material in Heavenly Blue. I find this color combination makes the room feel like a night sky, which is very conducive to sleep. I couldn’t be happier. And with the rest of my finds, I noticed this sort of black-and-white wallpaper moment happening that is reminiscent of Pierre Le-Tan’s drawings: each has the feeling of a sketch created with lots of fine, dark lines (which makes me think, M. Le-Tan: if you are wondering what to do next, please design some fabrics and wallpapers). Cole & Son has taken an archival Fornasetti print of clouds blowing in the wind, and turned it into a grayscale wallpaper called Nuvolette. The same company also has a line-drawing faux bois print called Wood Grain. And at Pierre Frey, I found a very chic vinyl paper (unusual to get those two words in the same sentence) called Indus Tise, which looks like a hand-sewn quilt with details of many little running stitches. What I love about these papers is how pretty and fresh they become when paired with a coral, blush or pink plaster. Alternatively, they can become rather Elsie de Wolfe and garden room-ish when paired with dark green. I’m currently persuading two clients of mine to pair the Nuvolette paper in their hall with a reddish-pink Braquenié carpet up the stairs. One really can’t go wrong with the most classically paired colors on the wall. Spring Drinks was originally published on the New York Times T Magazine blog. Words by Rita Konig.